International Women’s Day is a worldwide event celebrated on March 8th in various countries across the Globe. This special day is a perfect moment to honor women’s achievements from social to political to economic success. The fact is that marketers across the world are using various techniques and strategies to turn their campaign into a profitable event. Thousands of organizations across the world are eagerly associating themselves in organizing contests, events and ad’s that come with a subliminal message. There is also a lot that’s being expressed, after all, this is a perfect occasion to express gratitude to all female employees, customers, and entrepreneurs worldwide. As the women’s day is approaching, we have gathered some of the 5 best marketing campaigns that celebrate International Women’s day in the most creative way. One of the largest and the fastest growing consumer product companies P&G launches new corporate ad #WeSeeEqual. #WeSeeEqual is aimed at uncovering gender bias and discrimination. The campaign promotes gender equality in a very subtle yet creative way, allowing the audience to get closure to embracing new ideas in their own very personal way. The campaign and the ad use number of clips from a variety of their brands including Ariel, Always, Secret, Pantene and many others done on gender equality themes. Some P&G brands have been working as of late to tackle gender bias by changing mindsets of people and creating new expectations. Helping abolish gender-biased barriers to education for girls and social & economic opportunities for women through the program. One of the simple yet incredibly effective campaign by ELLE UK portrays instances where women are exhibited as one-offs. This ad deeply depicts about how men outnumber women, especially in top positions from corporate boardrooms to halls of Congress, from religious institutions to philanthropic organizations, from universities to the courts, men are more likely to be leaders. The data here indicate that there are just not enough women in the pipeline of leadership roles when compared to men. According to the statistics analyzed by the BBC, Women occupy on average 31.2% of the most senior positions across 11 key sectors, including business, politics and policing. Key Note: With all the difficulties, women are trying to make it to the top! It is time we salute these amazing women for being such incredible changemakers. The ad which features a picture of a beaten and bruised women who come with a message to stand up if you see violence. The digital billboard used a Facial recognition to record exactly how many people were looking at it. The more who stopped by to look at the women within the ad, the more quickly the injuries would heal on her face, if people ignored the poster, the image would remain with bruises and cuts. 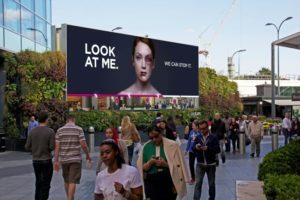 The interactive billboard here was simple yet a perfect tool to communicate the message for which it stood: “don’t turn a blind eye to domestic violence.” The campaign reached over 320 million people in more than 20 countries and achieved phenomenal success. The ad is all about the power of imagination that comes with a belief that anything is possible by women. Barbie’s amusing advert inspires young girls to be whatever they want. Raising a powerful girl to grow up and have an option of being a great teacher, doctor, writer, fitness trainer, coach, firewomen, an Olympic medalist in boxing, sergeant, celebrity, chef and even a president or whatever she desires. This trend not just encourages women to be independent but also makes her feel equal. Equal in terms of doing what she wants, getting paid the same amount for the same work that her male colleagues do and many other factors. It is our responsibility that we subtly ingrain the idea and the positivity to young girls from a very young age. Over the decades, the way beauty ads have been showcasing women to look a certain way that is beautiful and from it to find strength is ambiguous. There has been a huge amount of pressure on women to look perfect. This theory has not just set high standards and expectations for women but also for young girls to meet that are not reachable. Here we have Dove highlighting how women in the world are made to feel about themselves and have an unjustifiably low opinion of the way they look. In the ad, Dove has clearly explored the gaps between how women perceive about themselves and how others perceive them. The FBI forensic artist drew 2 portraits who never actually looked at the women, but drew based on the view or the description they gave about themselves. And the other where he drew their portraits based on other peoples view about them, which turned out to be much more positive. This incredibly emotive campaign showed how women distorted self-perception which affected their lives in many different ways. The ad fits into Dove’s wider, by encouraging women to live a happier and more confident life while helping women release beauty as a source of confidence, not anxiety. Apart from advertising their brands, the above campaigns have made an effective impact raising women’s issues and helping the nation of women overcome insecurities that stood their way. In anticipation of International women’s day, enjoy our roundup of the most memorable women-centric ad campaigns featuring empowered women.